Excellent! This update is supreme! 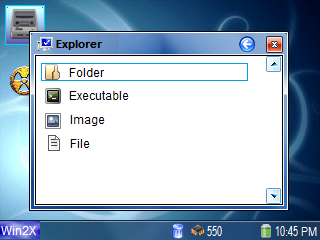 I can now select an icon for the items, and the text below the icons is an excellent addition, however I would have thought that would be more suitable on the desktop. Also, there is an inconsistency with the explorer window close button and the yes/no dialogue close button, which doesn't work. I would suggest to remove it as it is serving no purpose. The skinnable point of this application is awesome! I can now use Clearlooks for the frontend! Yaoy! Anyway, this is an awesome release. Only suggestion for next time is, could you make it possible to import INI files? It's a pain re-adding all the apps and games for every release. Very nice, chris! I'm enjoying the custom icon support! Oh, and by the way, you can just update the current node instead of deleting it and making a new one. This way the comments will stay intact. Could you perhaps create a text editor for the next release, with a QWERTY keyboard? WizWrite is proving to be a bit of a pain and I have no idea where Qtopia stores its files. Yes.I intend to implement an internal text editor.Don't know if it'll be in the next version though. I have already installed ver. 1.2 with every emulator setup properly (icons etc). How can I upgrade to ver. 2.1.0 without loose my setup ? I dont want to spend 2 hours to setup the icons again..
Just run "install.gpe".Your links will be preserved in the default Admin user.The only you will lose is the desktop links. ommpc2x doesn't work... otherwise great update! sgadams: I am currently working on compatibility issues with some reported software...Ommpc2x is already fixed and scheduled for the next release. Tried to upgrade from 2.2.0 to 2.3.0 and I lost everything ! (both emulator links and desktop icons).. There's something you did wrong... Did you run "upgrade.gpe" from the Win2X folder of the archive? oops I opened Wiz again and the icons are back !!! maybe a bug ? No..more like a pending synchronization of the filesystem. damn near perfect. Infinitely better than the packaged UI to say the least. Well done sir. Some error on the files of Win2X.The reason depends on what you did before it. Anyway,power the WIZ on,press and hold R until the recovery screen comes up. Select unistall Win2X and install a fresh copy of it.For a fresh copy just run "install.gpe" from the downloaded archive. Thanks! All working now :) keep up the good work!!!!!! First i want to thank you for this great frontend. I found two bugs, which i hope you can fix. 1. When you apply a wallpaper with space in its name(example: "a 1"), it only works until you log off. If you try to log in again, you will get a black screen. 2. In the new release(v.2.4.1) the touchscreen select in the startmenu isn't working properly. When you click on "games" you get an empty window. If you clicked one of the other options before and then on games, you'll get the games window filled with wrong links. Selecting with the dpad works without any problems. Thank you Sinthoras for the bug. The wallpaper file is not supposed to contain spaces,so try to avoid it. I just uploaded version 2.4.2 for fixing the start menu bug. Thanks, CHP! For all your hard work! The sound issue is fixed now. The whole frontend is now very solid! It's amazing! Version 2.4.3 Best thing ever, far better than the original Wiz menu, works awesome with FW 1.2.1, can't see anything wrong with it (the only problems I had were due to the touch screen being off). Truly supreme. The auto scan thing is everything I could have wished for! :D I will no longer have to add every game manually. Thanks for this! Suggestions for next release: A text editor. 10/10. Hey what up ive download the skin and install it. lunch it love it for a little will but after that it start freezing. Ive decide to delete it and after want I try to put it on it frozen on that loading start.Hold R button dosent work . Can some one could give me a tips for that. thx for help. I love Win2X. I currently use it as my main app launcher - it beats the GPH launcher by a lot. Ok just a small expression of concern: Win2X slowly degraded my system's performance. I noticed some games decided occasionally to not load from win2x but magically worked in the GPH default launcher. Also, I noticed it slowed down the animations of the main GPH launcher *AFTER* uninstalling win2x. A clean firmware re-install fixed my machine. Not to scare anyone away from using it, but i've used win2x twice now, both times with the same results. Help! I used this. It worked fine, but I shut off my system and now my Wiz won't boot. I get a blank screen after the bootup. Should I reinstall my firmware? Never mind. I read the above comments. Can you include to next release to select between QWERTY and QWERTZ layout? KermEd, can you email me your XP theme? (pawsdarmak@gmail.com) I'd appreciate it. Thanks!